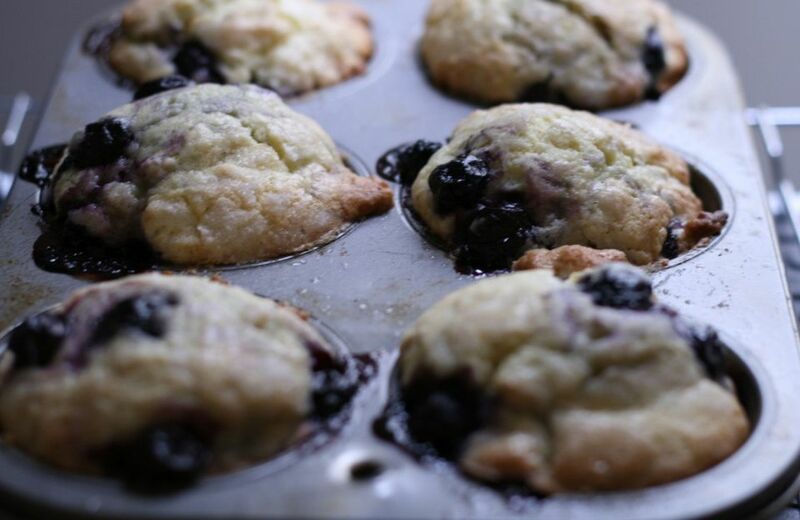 Need a basic blueberry muffin recipe that's quick and easy to prepare? You've just found it. To me, blueberry muffins deserve a spot amongst the most American of breakfast comfort foods. There's just something about blueberry muffins that trumps all other muffins (sorry, pumpkin muffins, you know we love you too), particularly when made at home. This super easy recipe combines just the basics—egg, oil, milk, flour, and sugar—to make a basic and simple homemade blueberry muffin. Nothing more, nothing less. Like making homemade muffins? Scroll down for a few more recipes to try. Spray the bottoms of a 2 1/2-inch muffin pan (regular sized) with non-stick cooking spray or a homemade olive oil cooking spray. Beat egg until foamy in a small mixing bowl. Then, beat in the oil and milk. In a separate bowl, sift together all dry ingredients: the flour, sugar, baking powder and salt, then, gently stir in the blueberries. Make a well in the center of this mixture and pour in the prepared liquid ingredients (the oil, milk and egg mixture). Mix together with a fork just until dry ingredients are moistened; this should be no more than 25 to 30 strokes. The muffin batter will be lumpy and that's ok.
Bake your muffins in the pre-heated oven for 18 to 20 minutes or until golden brown and muffins test done with a toothpick. Loosen with a spatula and turn out. Blueberry muffins, like any homemade muffins, are always best served warm and fresh out of the oven. Enjoy!